Ron Schneider announced new changes to Google Docs and Spreadsheets. Looking pretty - The entire document list has been given a complete visual overhaul - new icons, more content, and better organizational controls. We know users spend a lot of time here and we aim to make it feel more like home. Getting organized - Almost from the day we launched people have been clamoring for folders. They're here! Even cooler, our new folders continue to work like the tags they've replaced - your old tags are automatically converted to folders and documents can live in more than one folder at a time. Organizing your documents is as easy as dragging and dropping a document to a folder. We've also included special controls for seeing only those documents created by you or shared with a particular person. Search that thinks ahead - If you've ever tried Google Suggest, you know how cool it is when a search engine offer suggestions as you type. Google Docs & Spreadsheets now works the same way - we offer dynamically filtered results from your document list as you type, saving you time and getting you to your documents more quickly. I´m quite sure there will be in the near future a major update of Google Docs & Spreadsheets by adding presentation sharing capabilities to the same after the acquisition of Tonic Systems and Zenter. Google has then to find a new name for the extended web office suite. Maybe Google Co-Apps. An interesting debate between Andrew McAfee and Tom Davenport on the value of Enterprise 2.0. 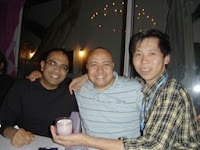 Video and Slides from Stephen´s talk in Taiwan on E-Learning 2.0. With the acquisition of Tonic Systems, "a technology for presentation creation and document conversion" in April, and newly Zenter, "a company that provides software for creating online slide presentations", Google is adding presentation sharing and collaboration capabilities to its Apps family towards a complete web office suite. Stephen Downes on Web 2.0 and personal learning; a presentation video with some nice photos from his recent trip to Taiwan. My PhD project is "Social Media for Knowledge Management and Technology Enhanced Leaning". Learning and knowledge management have become essentially two sides of the same coin as the two fields are increasingly similar in terms of input, outcome, processes, activities, components, tools, concepts, and terminologies. Apparently, previous models of learning and knowledge management have failed to address the problem of learner and knowledge worker performance. 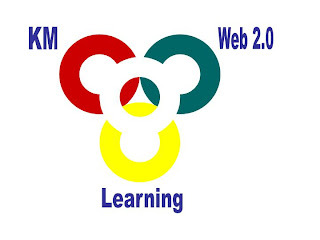 In the past few years, Web 2.0 concepts have been opening new doors for more personal, dynamic, and social learning. And, social media, also called social software, has emerged as the leading edge of Web 2.0 and has become a crucial means to connect people not only to information repositories but also to other people, in order to share knowledge and create new forms of social networks and communities. The goal of this PhD research is to achieve a new vision of blended learning defined by the convergence of learning, knowledge management, and Web 2.0 concepts into one integrated solution toward a new model of network learning through active participation in different communities. The main results of this PhD will be the design, implementation, and evaluation of a framework for social media supported learning (SMSL) and social media supported work (SMSW). How learning and knowledge management can be viewed as two sides of the same coin? Why previous models of learning and knowledge management have failed to address the problem of learner and knowledge worker performance? What are the factors needed for the success of future learning and knowledge management models? How Web 2.0 concepts and social media technologies can leverage learning, support the building and maintaining of knowledge ecologies, and enhance individual performance? 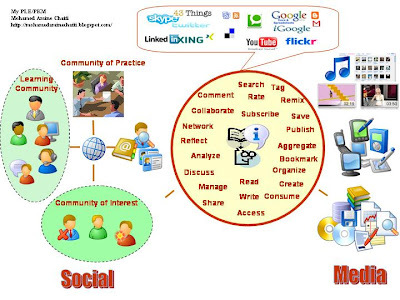 Why a social media driven approach to learning and knowledge management can succeed whereas previous models have failed? Here is 1 page description of my PhD project as pdf. Your valuable suggestions and comments are welcome! Google Gears, an open source browser extension for enabling offline web applications. Google Mashup Editor, an online editor that enables developers to create, test, and deploy mashups and simple web applications from within a browser. The GWT team also reported that GWT 1.4 Release Candidate - with many new features, improvements and optimizations - is available for download. According to Dan Peterson, Product Manager at Google, GWT has been downloaded more than 1 million times. We are using GWT for the development of the Personal Learning Environment Manager (PLEM) and I highly recommend it as a first Ajax toolkit solution for core Java developers. The program of the 7th IEEE International Conference of Advanced Learning Technologies (ICALT 2007) is now available. I´ll be presenting our paper "The Web 2.0 Driven SECI Model Based Learning Process". Learning and knowledge management are increasingly similar in terms of input, outcome, processes, activities, components, tools, concepts, and terminologies and can thus be viewed as two sides of the same coin. Nonaka and Takeuchi adopt a dynamic model of knowledge management, view knowledge as activity rather than object and focus on knowledge creation, collaboration and practice. This knowledge creation model has been referred to as the SECI model. The basis of this model is a distinction between two types of human knowledge: explicit and tacit. Explicit knowledge or information is codified, objective knowledge that can be transmitted in formal, systematic language. In contrast, tacit knowledge is not easily codified, difficult to express and subjective. Nonaka and Takeuchi argue that knowledge is created and expanded through the social interaction of tacit and explicit knowledge . Similar to the knowledge creation process, the learning process encompasses more than knowledge acquisition. It is a dynamic process within a collective intelligence, continuous knowledge in action, and cyclic conversion of tacit and explicit knowledge. This spiraling, highly dynamic and complex process is modeled in the figure above. It consists of four modes of knowledge conversion: socialization (tacit to tacit), externalization (tacit to explicit), combination (explicit to explicit), and internalization (explicit to tacit). Each of these modes will be discussed in detail below within a learning context, along with actual examples on how various Web 2.0 concepts and emerging technologies can be applied and used in conjunction with one another to support each mode of the learning process. Nonaka and Takeuchi point out that an individual can acquire tacit knowledge directly from others without using language. Socialization is the process of sharing tacit knowledge, i.e. the rich and untapped knowledge that resides in individuals such as know-how, expertise, understandings, experiences and skills resulting from previous activities, not through language but through observation, imitation, practice, and participation in different formal and informal communities. According to them, the socialization mode starts with building a “field” or “space” of social interaction. Social media provide great opportunities to build such spaces and hand on tacit knowledge from one person to another. Externalization is a process of articulating tacit knowledge into explicit concepts. It is generally based on metaphors, analogies, concepts, hypotheses, and models. According to Nonaka and Takeuchi, externalization holds the key to knowledge creation, because it creates new, explicit concepts from tacit knowledge. Blogs for example support the externalization process by giving voice to everyone and providing a space to capture personal knowledge and distributed discussions across blogs, immediately document thoughts, and annotate information. The nature of knowledge is such that we always tell more than we can write down . Consequently, tacit knowledge that may be expressed but cannot be easily recorded into formal documents and manuals can be verbalized via oral communications. VoIP and phone/video-conferencing for example are powerful tools to trigger externalization via open participation, dialogue, and discussion. Social media in general offer unique means for effective capturing of context-rich and quality knowledge as it gets created, with a minimum amount of effort. Collaboration contextualizes content. For example, discussions around a blog post through comments and trackbacks give more context to the codified knowledge. And, recording of phone/video-conferences and instant messaging sessions support the online capturing of context-rich knowledge as it gets created. The collective intelligence ensures that knowledge is up-to-date and relevant. In fact, knowledge captured by many is much more likely to be of better value. Wikis are good examples of the collective intelligence at work. They provide an opportunity for social interaction and collaborative knowledge capturing. Knowledge can be expressed and captured through different possible modes of representation and expression including words, spoken or written; image, still and moving; video; music etc. Each medium has its own affordances, its own systems of representation, and its own strategies for representing knowledge . Consequently, learners need to reflect across media; that is get familiar with a range of different media tools and determine which is most effective in capturing their knowledge. This is however not a big challenge, since today’s teenagers and kids are growing up digital and are comfortable with various media. Emergent social media provide learners with effective ways to capture and publish their knowledge in a number of ways and in a variety of media such as pictures, video or audio recordings. Knowledge capturing and publishing becomes easier through increasingly better devices that can capture high-quality audio and video. Combination is the process of systematizing concepts into a knowledge system, and it integrates different bodies of explicit knowledge. Once knowledge is captured, it becomes explicit knowledge i.e. information that can be stored and accessed. Unlike traditional centralized learning object repositories, blogs and wikis build distributed community information stores with up-to-date, context-rich, and searchable learning assets. The captured information can then be transferred within a social context. Blogs and wikis allow quick and wide information dissemination across classroom and organization boundaries. Pod/vodcasting is growing in popularity as a powerful tool to share audio and video recordings. RSS is a successful technology that makes it easy to share resources across networks, as it brings content from different sources (e.g. new blog posts, podcasts) to a learner’s personal space, once she has subscribed to the feed source. The captured information can also be managed individually or collectively. A blog is a very valuable tool for personal information management and wikis and folksonomies are highly effective forms of collaborative information management. During the combination process, reconfiguration of existing explicit knowledge through adding, reorganizing, and combining, can lead to new knowledge, possibly more complex. Other Web 2.0 technologies such as mashups can be used to pull together content from more than one source, remix and assemble it to form a new service. Since information is available in different forms such as texts, images, sounds, and videos, we need federated search technologies that make it possible to perform search across media and plug into multiple distributed repositories to locate relevant learning resources with a single query. We further need social and community-oriented search technology that builds on the collective intelligence to locate quality resources and services as well as appropriate communities and experts. The collective intelligence decides what is valuable through filtering, rating, feedback, reviews, criticisms, and recommendations and supports the certification of people’s expertise and the assessment of individual digital reputation. Amazon’s review and recommendation system, YouTube’s rating scheme, Google’s PageRank algorithm, eBay’s feedback, Flickr and Del.icio.us’ social tagging, Digg’s voting are successful examples of the collective intelligence at work. The search result should be modular content that can be remixed and aggregated to generate personalized learning resources, third-party lightweight services that can be mashed up to form adapted learning services, personal learning environments (PLE) that can be connected to build a learning community, and small communities that can be networked to create interdisciplinary learning clusters. According to Nonaka and Takeuchi, internalization is the process of embodying explicit knowledge into tacit knowledge. Explicit knowledge is internalized into individual’s tacit knowledge bases in the form of mental models or technical know-how. Learning by doing triggers internalization. Bringing learners competitively and cooperatively together via multi-player games and multi-user simulations offer the potential to learn through a new form of social experience. Games encourage us to take risks and learn through trial and error. Simulations broaden the kinds of learning experiences we can acquire by getting a chance to see and experiment things in a safe environment that would be impossible in the real world . Internalization is also a process of continuous individual and collective reflection. Effective reflection requires the mastery of different skills such as the ability to see connections and recognize patterns and the capacity to make sense between fields, ideas, and concepts . G. Siemens, Knowing Knowledge, Lulu.com, ISBN: 978-1-4303-0230-8. H. Jenkins et al., Confronting the challenges of participatory culture, MacArthur Foundation, 2006. I. Nonaka and H. Takeuchi, The Knowledge-Creating Company, New York: Oxford University, 1995. D. Snowden, Complex Acts of Knowing - Paradox and Descriptive Self Awareness, Journal of Knowledge Management, Special Issue, July 2002. G. Kress, Literacy in the New Media Age, New York: Routledge, 2003. 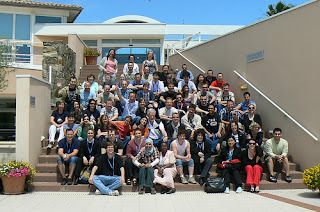 Last week, I attended the PROLEARN summer school in beautiful Fréjus, France. I couldn´t imagine before the amazing time I had there. It was indeed a merry time especially with the 2 Tims, Kien, and Hai. We had a lot of fun together. 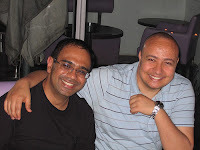 Tim has written about the nice moments at the summer school in his blog. Erik, who for me was the best speaker at the summer school, has also blogged on the 2 days he spent with us there. It was also a very fruitful time of networking with peers. Different talks, workshops and social events have been organized. PhD students from all over the world who are mainly working in the area of technology enhanced learning have come together to get to know each other, discuss and exchange their ideas and future research plans. It was really a very successful summer school!